A Sunday morning electrical fire at a building that houses the offices of several news networks in Northwest D.C. forced networks to move temporarily and another to end their live broadcast. WASHINGTON — A Sunday morning electrical fire at a building that houses the offices of several news networks in Northwest D.C. forced networks to move temporarily and another to end their live broadcast. 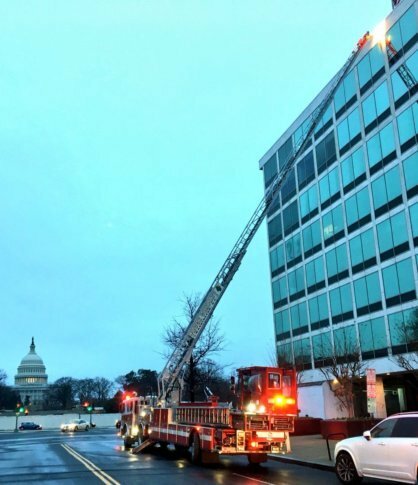 D.C. Fire and EMS responded to a box alarm on the 8th floor of an office building on the 400 block of North Capitol Street Northwest at 8:30 a.m. Sunday. The building houses NBC News, FOX News, C-SPAN and MSNBC. No injuries were reported, but smoke and water caused damage to the NBC facility. The sprinklers had been activated and the fire was extinguished in about 20 minutes, according to tweets from D.C. Fire. C-SPAN operations were interrupted but have since returned to normal program operations and a Fox News spokeswoman told WTOP that all employees were evacuated. “It was a major effort rushing to get this done within two hours and moving an entire operation to the station to get the show on air,” the FOX spokeswoman said.